Stickers & Labels are very widely used when an object requires identification with a word or idea. Brand stickers may be attached to products to identify those products as coming from a certain company. They may also be used to describe characteristics of the products that would not be obvious from simple examination. They are frequently distributed as part of promotional, advertising, and political campaigns. Print stickers & labels to enhance your marketing program. Print custom stickers & labels to reinforce your advertising message. We offer Complete range of high quality Self Adhesive Labels Stickers with multi color printing on all self adhesive materials. 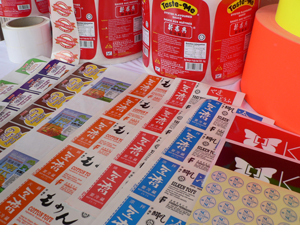 We also able to apply many kinds finishing on your Labels Stickers. A Sticker is a type of a label. Often it is a piece of paper or plastic, sticky on one side, and usually with some pattern on the other. They can come in many different shapes and sizes (usually colourful) and are put on things such as lunchboxes, in children's rooms, on paper, lockers, notebooks and so on. Some people also choose to collect stickers and trade them with friends. Stickers were invented in the early 1900s by Kalub (Beaver) Apps. Stickers are very widely used when an object requires identification with a word or idea. Brand stickers may be attached to products to identify these products as coming from a certain company. They may also be used to describe characteristics of the products that would not be obvious from simple examination. A Label dispenser is often used as a convenient way to separate the sticky label from its liner or backing tape. They are frequently distributed as part of promotional, advertising, and political campaigns; for example, in many voting districts in the U.S., stickers indicating an individual has voted are given to each voter as they leave the polling place, largely as a reminder to others to vote. Other methods of underground forms of voting for your favorite graffiti artists' current productions are by an open form of appreciation such as clapping while passing such a sticker (a smile and a kind reminder to a fellow appreciator throughout the day is commonplace as well). Stickers placed on automobile bumpers, called bumper stickers, are often used by individuals as a way of demonstrating support for political or ideological causes. Identification of vehicle registration and last service details are two examples of stickers on the inside of most car windscreens. The term "window sticker" is generally used for vinyl labels which are stuck to the inside of a vehicle’s window, as opposed to water-resistant stickers that are stuck to the outside of a vehicle but can be affixed to anything. Another common use for stickers is embellishing scrapbooking pages. With the advent of this very popular craft, every type of sticker imaginable can now be found: acrylic, 3D, cardstock, epoxy, fabric, flocked, sparkly, paper, puffy, vellum and so much more. While in the earlier days of scrapbooking stickers were sold mostly on 2"×6" sheets, now 6"×12" and even 12"×12" size sheets are very common.